This paper for the 23rd ICDE World Conference on Open Learning and Distance Education, Maastricht, The Netherlands, was co-authored with: Fiona Carey, Open University, UK, Whitney Quesenbery, Whitney Interactive Design LLC, and Ian Roddis, Open University, UK. The Open University’s mission is to be ‘open to all’. Most courses (the OU’s name for a module of study) have no entry requirements. We attract many students with no previous qualifications of any kind, even from high school. But our range is wide: we have strong professional and postgraduate offerings, including a highly-respected MBA programme, and a range of other taught masters degrees, including research methods qualifications aimed at students who will progress to PhD work. And, proud of our research, we thrive on a lively population of PhD candidates and post-doctoral researchers. • 580 courses that can be combined to achieve 230 qualifications. For our typical UK enquirers, this complexity is increased because most UK universities offer degrees with little choice. If a student wants to study Mathematics, a typical UK university will offer a 3-year intensive curriculum in Mathematics, with no requirements for studying any other subject. The concept of combining courses across disciplines in flexible ways to achieve a qualification is as unusual for them as it would be familiar to a typical USA or Australian enquirer. We are proud of our flexibility, but we are also aware that its unfamiliarity can be daunting. 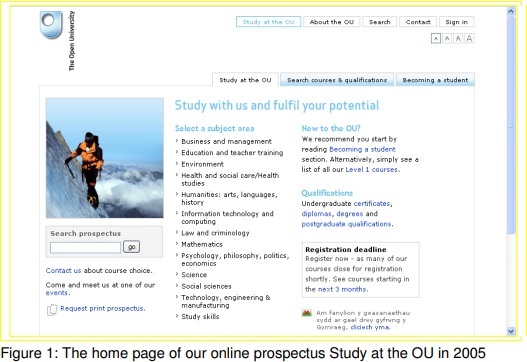 Our team’s challenge is that of presenting our online prospectus, Study at the OU. • What was their best starting point? • What was their best route to an appropriate qualification? • What combinations of courses were allowed? What combinations made sense? 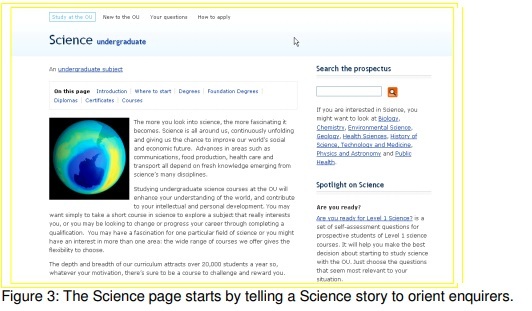 When we started this project, our prospectus was presented as a course-based ‘product catalogue’: lists of links, with little supporting text. Figure 1 illustrates the home page of our prospectus as it used to be. A click on a subject plunged learners into lists of qualifications available in that subject, as in Figure 2. • how they might gradually build up towards a qualification. In usability testing, we saw enquirers plunge into study paths for which they were completely unsuited, and fail to spot entry points that would have been perfect. Many of them failed to understand even that the OU is a distance learning university. modularised world that is the OU. And, for existing students, already on an OU study path and more knowledgeable and confident about their study routes, we wanted to answer the ‘What next?’ question. In redesigning the website, we focused on creating a ‘dominant narrative’ for enquirers, based on the presentation of subjects, qualifications, starting points and courses. The new structure starts from the story of a subject and how it relates to the learners’ goals. Only then are the higher education “products” – qualifications and courses – offered. Our research (Leach, 2006) suggested that our students identified strongly with their subjects, and thought of themselves as ‘biologists’ or ‘geographers’. We also knew from our search log analysis (Quesenbery et al, 2008) that visitors arrive at the online prospectus with specific subjects in mind: ‘psychology’, ‘social work’ and ‘law’ consistently rank in the top 10 of searches. • put into context the study choices and career paths they offer. So the specific Open University qualification in chemistry, for example (BSc (Honours) Molecular Science), appears only after the ‘Chemistry’ message has been thoroughly explained. Although OU courses can be studied on their own – for personal interest or professional development – most students are aiming for a qualification. And we want to encourage them to do so. For both marketing/recruitment and enquirer-needs, we wanted to help visitors to understand the range of qualifications available. Our new 25-word descriptions for each degree help enquirers and are also ideal for search engine optimisation. So, we’re making a better job of bringing in the enquirers, and that’s good. But, once our enquirer knows that it’s biology, or creative writing, that they’re interested in, where should they start? Many of our level-1 courses are interdisciplinary, suitable as an introduction to several subjects or qualifications. Because of this, level 1 courses are often not specified in the requirements for a qualification, leaving learners struggling to work out the best starting point. We decided to identify a “where to start” course in each subject, limiting ourselves to a maximum of five choices (out of the 100 available). This was a struggle. Many of our colleagues wanted – in the name of flexibility and choice – to list all the possible options. However, the point was to facilitate the choice for the users, to relieve them of the searching and the trawling they had previously had to do. At each of these ‘Where to start’ points, we also offer our ‘Openings’ courses, specifically designed support-intensive, non-exam, short courses for people without previous educational qualifications who need to boost their confidence and their learning skills before embarking on true university level study. The historical OU approach of focusing on courses, and the flexible Open Degree, results in a weak relationship between the course listings and the qualifications they are part of. This flexibility is still available, but placing courses at the end of the navigational story – reached by selecting a subject and then a qualification – placed them in a context, and makes the broad variety less daunting. One of our goals is to enhance the courses ‘story’ by showing study pathways, and how a course might eventually lead to a qualification. The story, broadly, says ‘You can come and do this, dip your toe in, and if you like it you could acquire useful qualifications that will enable you to work in this field’. In some cases, where is a clear study pathway – say, a certificate you can build into a diploma, which you can build into a degree – this natural progression becomes part of the subject ‘story’. 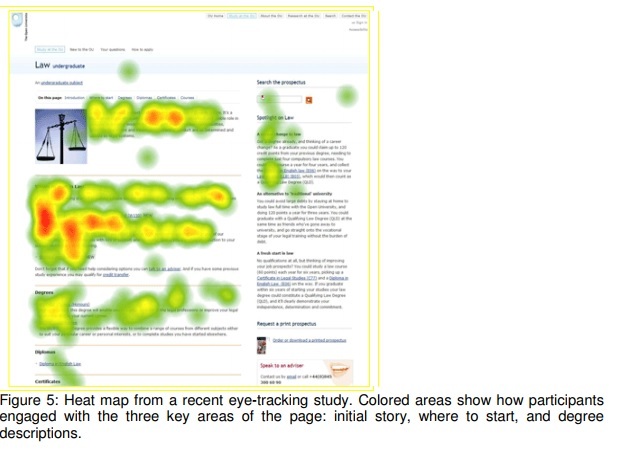 Since we launched the site in March 2008, usability testing suggests that the approach has been successful. Participants in our study avidly read, and acted upon, the material presented in the three new sections: the stories, ‘where to start’, and the degree descriptions. Equally importantly, the changes have been accepted by our vast and engaged student body, many of whom were (and remain) intimately familiar with the online prospectus, and frequently visit. • Academic logic: they map well on to our faculty structure and the Joint Academic Coding System (JACS) categorisations. • User expectations: enquirers regularly search for ‘Psychology’ and ‘Law’, so these get entries of their own despite being located at Department and Centre level respectively within our faculty structure. In our usability testing, we found that these top-level subjects worked well: users clicked confidently into an appropriate choice. And our academic colleagues have adjusted to the same framework. • Areas of ‘thin’ or non-existent curriculum. For example, the Environmental Decision Making sub-subject is strong at postgraduate level but has little available for undergraduates. • Some sub-subjects were difficult to tell apart; we had both ‘Childhood and Youth Studies’ and ‘Children and Young People’. • Subjects that didn’t have enough sub-divisions; the whole of the Business School curriculum at undergraduate and postgraduate was being forced into only two areas. • Faculties had adopted different positions about what they wanted in ‘their’ areas; some were inclusive, others didn’t want to advertise courses that they hadn’t created. We were faced with a framework that worked well for learners, but which did not fit the curriculum. We have spent a lot of time and energy attempting to rationalise the framework, and it has been an interesting journey! Not only for the actual changes and improvements that have been made (although we’re quietly proud of them), but also for how it’s been done. • Some were suspicious about the Subjects Framework structure, which hadn’t – for the most part – permeated deeply into the faculties. • Some saw ‘their’ curriculum as being differently structured from everyone else’s and so unsuited to any common approach. The peculiar intensity of course and qualification production in a distance-learning institution can often make it difficult for academics to maintain an outward-looking perspective. Courses are seen as ‘ours’ (the faculty’s, the programme committee’s, the department’s, or the course team’s) and rarely as part of a University offering. would need, to some extent, to change cultures too. So, we needed to build trust, and try to establish a more external-facing mind set. This has been a long process! We met colleagues regularly, to solicit reaction to what we were proposing, to get ideas about the directions we should take, and to keep them informed of our own thinking. During the process of writing stories, creating ‘where to start’ guidance, and writing descriptions of qualifications, we learned that our academic colleagues reacted more positively to ‘best guesses’ than to blank templates. We suggested to them that our best guesses would be ‘not entirely right, but hopefully not entirely wrong’. In addressing the sub-subjects, we avoided arguments about the theory of the curriculum, sticking to the practical problem of supporting learners in their choices. For example, in Business and Management, we started again with the qualifications and identified five clear pathways that would better represent progression through the curriculum. Our faculty colleagues were delighted with the re-arrangement, and worked with us to produce revised stories that provide much clearer ‘journey information’. Bear in mind, we aren’t changing the content of the curriculum, merely rationalising its presentation to the outside world. We know (from usability studies) that learners really aren’t interested in which department produced the course. Instead, they want practical help: How does it fit into the scheme of things? Is there an exam? What do I need to study before this, and what can I study after it? We often found ourselves saying: ‘It isn’t about ownership; it’s about telling the story to the user’. This became a mantra, and we put into the footers of our document templates. And, gratifyingly, people are starting to say it back to us! With some confidence that our qualifications will appear in a rational place within the subjects ‘story’, our next challenge is to look at the detailed choices that students have to make as they progress towards their chosen qualification. Although, we’re in the process of creating ‘focused routes’ through degrees, that will enable students to identify more easily their preferred route through a given degree, this approach will not allow us to provide the more explicitly personalised information and advice that we aspire to. We want to provide both enquirers and students with access to the web-based planning tools that will enable them to explore options and to make better choices (and the University to increase retention rates). Providing these answers requires us to go beyond even the logical framework of subjects, qualifications and ‘where to start’ courses. And further, beyond these manually-crafted routes (though this process will undoubtedly facilitate understanding and study-planning in the midterm). Our next ambition must be to create a ‘qualification brain’ – a flexible tool that can manage the vertical and lateral relationships between qualifications, offer an intelligent and accessible way of managing the courses that go to make up degrees, and will ultimately allow users to personalise their website experience to their own particular circumstances and study objectives. Leach, J. (2006) ‘Research into course choice’, Jeremy Leach Research, Open University internal research paper. Quesenbery, W., Jarrett, C., Roddis, I. Stirling, V. and Allen, S (2008) ‘Search is now normal behavior: What do we do about that?’ in Proceedings of the Usability Professionals’ Conference, Baltimore, MD.